Axway API Portal is a self-service developer portal layered on both API Manager and API Gateway. With API Portal, you can enable both internal or external client application developers to browse, consume, build, and test APIs for use in their applications on their own. You can use several channels, such as FAQs, articles, forums or blogs, to provide more information for the developers and to encourage developer engagement. The look and feel of the web-based API Portal is fully customizable to match your brand and image. API Portal is part of the AxwayAPI Management Plus solution. For more details, see API Management Plus Getting Started Guide. API Portal is built on Joomla!, an open source CMS platform for developing and deploying websites. For more details on Joomla!, see the Joomla! homepage. User and application administration — You can execute basic operations, such as approvals and rejections, on both API Portal users and their applications. Content management for additional documentation — You can use content management capabilities of Joomla! to provide additional content relating to your APIs and API Portal to your developer communities. For examples, you can include PDF documents and videos and display them in the API Portal. Customization to provide a branded experience — You can customize the look and feel of API Portal to match your own brand, and provide a branded developer portal. Self-registration and profile management — Application developers can self-register and manage their profiles. 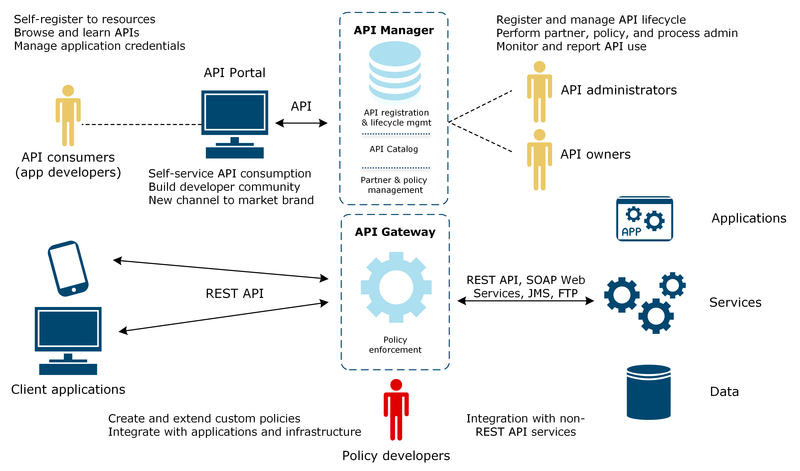 Browsing and testing APIs in API Catalog — API Catalog contains the APIs that have been registered in API Manager and are available for use. Application developers can browse these APIs and their associated documentation, and invoke APIs using the built-in test capability. Creating and managing applications — Application developers can register their applications that use the APIs, and obtain API Key or OAuth or external credentials for their applications. Monitoring API usage — Application developers can register their application's use of APIs through graphical real-time charts. This feature requires API Gateway Analytics, because the metrics data is sourced from there.